Clara Reid de Frankenberg administers the oath. 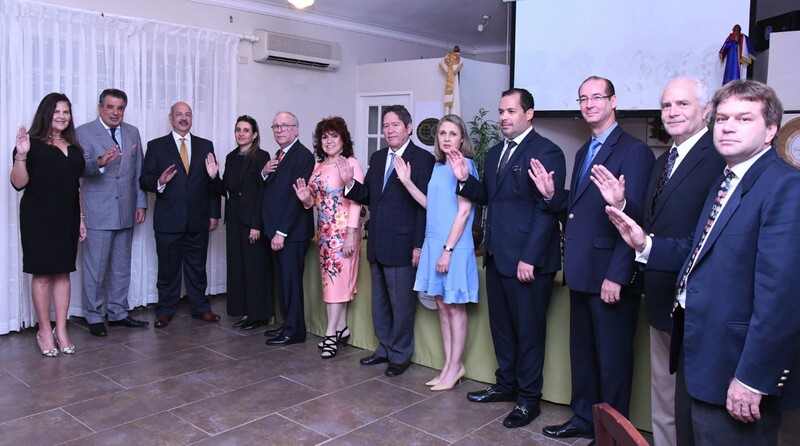 Santo Domingo.- The new dean of the accredited Consular Corps in the Dominican Republic, Clara Reid de Frankenberg, highlighted the role, which she considered invaluable, that honorary consuls perform in trade, economic, cultural and scientific relations between the state and the countries that maintain diplomatic ties. Reid de Frankenberg, who is Norway’s honorary consul in the country, said the Consular Corps consists of 138 consuls, prominent Dominican citizens and foreigners, representing more than 80 nations that delegate their political, economic and political relations and the safeguarding of their interests. Reid de Frankenberg replaces Enrique De Marchena Kaluche, Honorary Consul of Jamaica in the country, who presented his memoirs and a report of the management that ends, in the assembly held at the residence of the consul of the Principality of Monaco, Sonia Villanueva. The new board of directors is also integrated by the honorary consuls José Manuel Romero, Albania, vice-dean; Fernando González Nicolás, Malaysia, secretary; Gustavo Vega, Poland, deputy secretary; Virginia Velázquez de Simó, Russia, treasurer, and Federico Reyes, honorary vice-consul of Trinidad and Tobago, vice-treasurer. Honorary consuls: Julio Oscar Zeller, Namibia; Virgilio Pérez Bernal, El Salvador; Antonio Lama, India; Tomas González, Kazakhstan; Emilio Hasbun, Barbados; Roberto Casoni, Italy, in Puerto Plata and the North region; and Bettina Panzardi, Uruguay, area of ​​Punta Cana and the East. Honorary consuls: Ricardo Koening, Antigua and Barbuda. Appointed as advisers: Rosendo Álvarez III, Estonia; Juan Barceló Salas, Belarus, and past dean Enrique de Marchena Kaluche, Jamaica, in Puerto Plata.